About Checkered Hat- Cooling Down: The French train their thoroughbred racehorses in huge paddocks on trails that run through the forest. The piece was self-assigned and was done on a trip with my daugther Jill who served as my guide, translator, advisor and the person in charge of "keeping dad out of trouble." A wonderful adventure shared together that neither of us will ever forget. 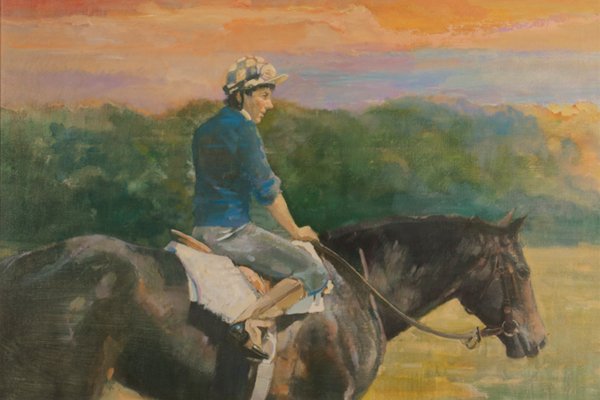 This work was inspired by Virginia Craft Payson, a true sportswoman, philanthropist and noted horsewoman in her own right, who suggested I go to France for a truly memorable view of the sport as only the Fench do it. This is one of my favorite peices from the thoroughbred racing series. It resides in a private collection and has never been offered. It is a wonderful piece to hang if you love the sport of kings.